This term applies to the ongoing effort of maintaining very close matches in color across all devices within a digital imaging system. A system can be comprised of many digital instruments: digital scanners, digital cameras, monitors, computer printers, and offset presses. As a product travels that system in its creation, each component of the system must translate the product’s color as identically as possible to attain an excellent outcome. The International Color Consortium (ICC) has defined a cross-platform view of color management to “standardize” the interpretation of color for its daily use which includes the implementation of standard color profiles in computer operating systems and related devices. We use the most advanced color matching systems to produce consistent, accurate color on all of your printed pieces. Why do I see a difference between my screen and printed version? The simplest answer is one of acronyms: RGB versus CMYK. Monitors create color by emitting light through the red, green, blue (RGB) color spectrum, which produces a wide gamut of the color spectrum. Printed images derive their color through cyan, magenta, yellow, black (CMYK) inks that filter color as light is reflected or absorbed by the paper. This produces a more limited gamut of the color spectrum. Consequently, the same art designed and displayed on a color computer monitor RGB, may look quite different when printed on paper in CMYK. What does ‘spot color’ mean? In offset printing, spot color refers to any color generated by an ink (either pure or mixed) and printed in a single run. Spot colors are typically derived from four CMYK spot colors (cyan, magenta, yellow and black), but some more advanced processes add orange and green (CMYKOG) to create a six color spot process called hexachromatic. The Pantone Matching System (PMS, see below) help print professionals and designers determine a standardized continuum of spot colors available for artwork. What is ‘Pantone’ or ‘PMS Color’? Pantone LLC is a leader in color management within the industry. 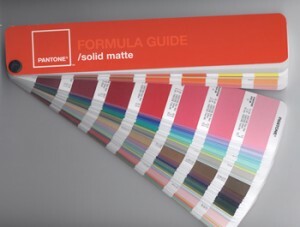 It is well known for its Pantone Matching System (PMS), formulas to define and label the color spectrum for various media in order to assist color specialists, printers, and designers. PMS is used primarily for print projects, but also for colored paint, fabric and plastics. Pantone has developed color paddles based upon their formulas (one for Solid Matte colors is shown below). The paddles are very helpful tools that provide a resource of defined and numbered colors for standard reference. Professionals can accurately and consistently reference color by number (e.g., Red 200U) during all stages of creation.